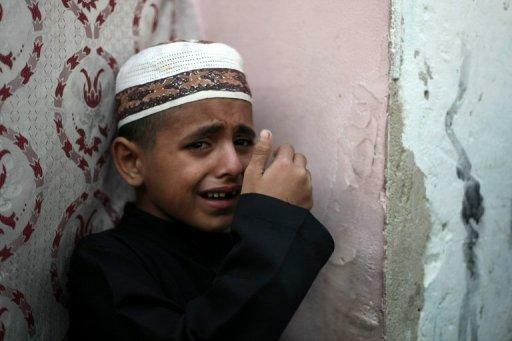 Two Gazans died in an Israeli strike on Sunday, raising to five the total number killed as Israel pressed a series of raids targeting militants, among them a top Salafist leader. Palestinian witnesses said the latest Israeli strike targeted a motorcycle near Deir al-Balah in central Gaza, killing two militants in their early 20s. 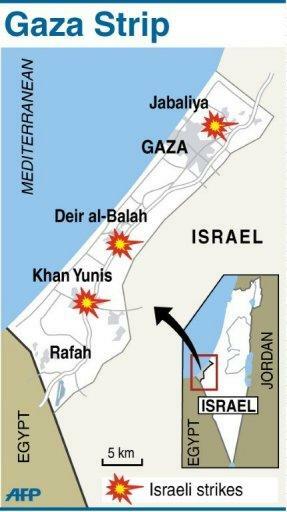 The Israeli army confirmed the strike, saying it had targeted "a terrorist rocket squad." Ashraf al-Qudra, spokesman for the Hamas-run health ministry, told AFP the strike killed Ezzedine Abu Nasira, 23, and Ahmad Fatayer, 22, and left another two people in critical condition. An Israeli army spokeswoman said they were targeted after firing a rocket into Israel that landed in the Eshkol regional council flanking the southern sector of the Gaza border, without causing injury. It was the third deadly Israeli raid within 24 hours and came just hours after Prime Minister Benjamin Netanyahu vowed to "act aggressively" against anyone threatening to attack Israelis. "Global jihad is increasing its efforts to strike at us and we shall continue to act aggressively and forcefully in response," he told ministers at the weekly cabinet meeting, saying the military would also engage in "preventive strikes." The surge in bloodshed began on Saturday night when the air force targeted a motorcycle in the northern town of Jabaliya, killing top Salafist leader Sheikh Hisham al-Saedini, 43, and a fellow militant called Fayek Abu Jazar, 42. Saedini, a Palestinian with Jordanian citizenship, headed a Salafist group called Tawhid wal-Jihad, or the Mujahedeen Shura Council, which has claimed responsibility for firing a handful of rockets at Israel over the past six weeks. A 12-year-old bystander was wounded in the raid, medics said. Several hours later, warplanes targeted two militants from the armed wing of the Popular Front for the Liberation of Palestine in the southern city of Khan Yunis, killing one and critically wounding the second. The dead militant was identified as Yasser Mohammad al-Atal, 23. The strike came shortly after a rocket hit an open field in the Eshkol region, with the army saying the dawn raid had targeted "a terrorist squad." Saedini was one of the top Salafist militants in Gaza who founded the Mujahedeen Shura Council at the end of 2008. He was buried in Bureij refugee camp in central Gaza. The Israeli army said it had targeted Saedini over his group's involvement in "significant terror activity against Israeli civilians and... soldiers." It said his group was behind an attack in late January 2009 that killed a soldier and seriously wounded another, and said he had in recent days been "planning a complex attack to be carried out along the Sinai border" in collaboration with Salafi operatives inside Egypt. But Islam Shahwan, a spokesman for the Hamas interior ministry, accused Israel of targeting "innocent civilians." He said the attack was an attempt to make up for Israel's "severe security failure" on October 6 when a drone sent by Lebanon's Hezbollah militia managed to enter Israeli air space before being shot down near the Dimona nuclear reactor. Saturday's strike was the second time in a week that Israel had targeted what it describes as "global jihad" activists. On October 7, two Salafists were critically wounded in an Israeli strike on the southern city of Rafah, and one later died. Another eight people were injured, among them five children. 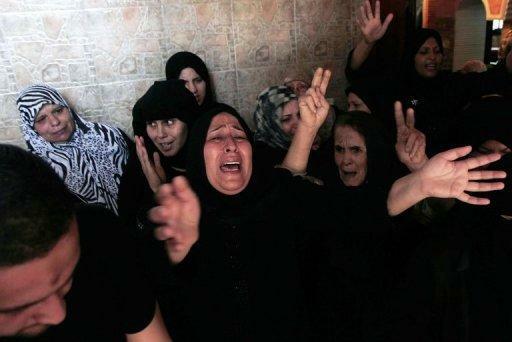 In response, the armed wings of Hamas and Islamic Jihad unleashed a barrage of rocket fire. The last time Hamas militants fired on Israel was during a flareup in June when militant groups fired more than 150 rockets, wounding five, and Israel hit back with air strikes that killed 15 Palestinians.